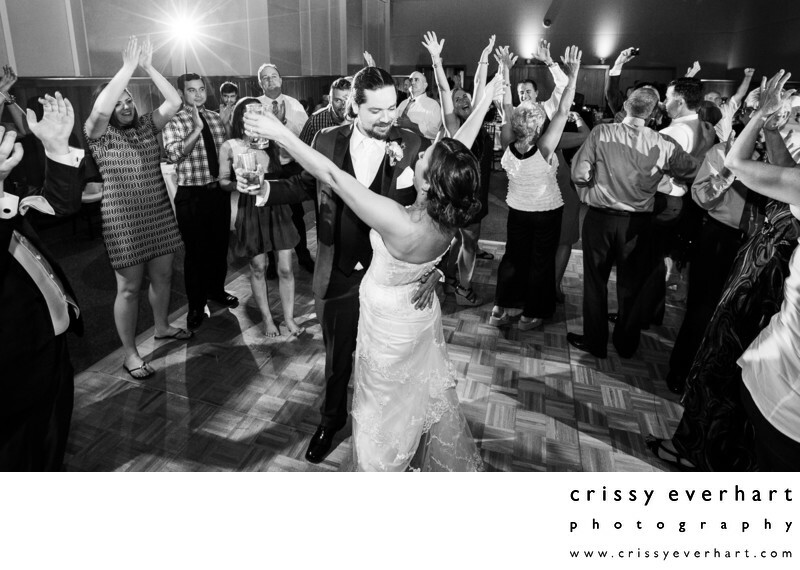 This bride and groom dance together as their family and friends dance around them, celebrating their marriage and partying at the Chester County Historical Society in West Chester, Pennsylvania. These guys are big Grateful Dead fans, and they were dancing to a Dead song at this moment! Guests' hands are raised as everyone claps or raises a glass to the newlyweds. This bride is a teacher, so having her wedding at a Historical Society in her hometown seemed like a perfect spot. The ceremony was in Marshall Square Park in West Chester and everyone walked a few blocks to the CCHS for the cocktails and reception.